'Classical Symphony'. Photo by Winkipop. Together Live was a most exciting and impressive mixed bill that had something for everyone. It combined the talents of the Sydney City Youth Ballet (of the Tanya Pearson Classical Coaching Academy) and the SYO Philharmonic. ‘Les Sylphides’. Photo by Winkipop. The SYO Philharmonic, as enthusiastically led by Brian Buggy OAM, was splendid, with a rich, warm tone. Buggy was dramatic, magnetic and precise. The SYO shone in the opening Prokofiev overture (Symphony No 1 Mvt 111, very Romeo and Juliet-ish, sprightly and lyrical) and were thrilling in the tempestuous Prelude to Wagner’s Lohengrin with strident horns and rich strings. The Orchestra were on stage the whole time, mostly hidden by a scrim. There was no set as such for most of the works, but there was a chandelier. After the Prokofiev overture, we saw Classical Symphony, choreographed by Wim Broeckx to Prokofiev. It was plotless, a showcase of the dancers’ technique, and was sort of abstract Ashton in style. There was great use of blocks of lines and criss-crossing patterns of choreography for the corps de ballet, wonderful floating lifts, and much use was made of supported pirouettes and delicious arabesques. It showcased the need for strong pointework excellently executed, and also displayed the men’s terrific jumps and ballon. ‘Le Corsaire’. Photo by Winkipop. Then came Audrey Freeman and Cameron Holmes in the show stopping Le Corsaire pas de deux. Holmes was in turquoise with a silver stipe on his ballooning pants, Freeman in very pale pink. Freeman was radiant, like a fairy princess, seemingly delicate yet with a steely technique. Holmes channelled his inner Nureyev and unleashed amazing jumps and turns in his spectacular solo and was a splendid partner in the tricky lifts. After interval came a selection from The Nutcracker – a delightful “Waltz of the Flowers” (choreographed by Pearson in the style of Petipa and Ivanov) for a large ensemble , with lots of criss-crossing patterns and lines and blocks of movement. It was sugary and filigree, with the ensemble in pink tutus and tiaras, with choreographic echoes of Petipa’s Swan Lake. The Grand pas de deux, as choreographed by Ben Stevenson, was performed by two guest artists from the Queensland Ballet, Mia Heathcote and Joel Woellner. There were high acrobatic lifts and very difficult backward lifts. Heathcote was amazing with her incredible control of her slow développés and enchanting in her solo to the Sugar Plum Fairy music. Woellner, in white, showed off his sensational leaps and turns. Both were tremendous in the excellent coda. Les Sylphides is a very difficult ballet to catch the elusive, dreamy, romantic atmosphere just right, but here Janae Kerr and Alexander Smith succeeded brilliantly, establishing the haunting, misty, ethereal mood. The two final works choreographed by Adam Blanch, Redemption and The Sky is Falling, were extremely different, edgy and contemporary in style. They appeared to be two parts of the same work, continuing the idea, reflecting on love and loss. 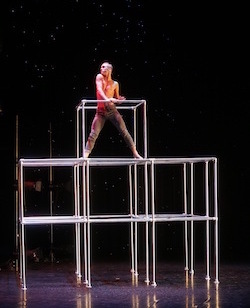 Both made use of a silver scaffold set that Aaron Matheson was at first trapped in, then swung, hung, climbed and slithered over – with allusions to Tetley’s Pierrot Lunaire. It appeared to be snowing the whole time in the pieces. Seymour Milton’s music was at times lyrical and rippling, at others driven and relentless. Matheson has a striking, intense and powerful solo, Audrey Freeman gave a strong performance as his would-be girlfriend. In The Sky is Falling, there was strong ensemble work, with the corps de ballet undulating and pulsating, or in blocks of movement or diagonal lines; but at times, it seemed perhaps a trifle, incoherent and messy. Both Matheson and Freeman had dynamic solos. There was much rapturous applause and cheering at the end.